Not only does the Land of the Giants theme feature in the Boxing Day airing of the new Stephen Fry and Christopher Eccleston version of The Borrowers, but we’ve also spotted recent television commercials using the giant and little people concept. Alan Carr’s New Year Spectacular for Channel 4 this year is being promoted in advance with a giant Alan Carr standing by Big Ben. You can also see the little people theme being used in quit smoking campaign commercials. Land of the Giants just got a mention on the BBC Breakfast Show during a discussion on the new adaptation of The Borrowers, 7.30pm on Monday 26 December on BBC1. The 90 minute movie stars Stephen Fry and the effects look excellent and the little people proportions and ideas are very reminiscent of Land of the Giants. 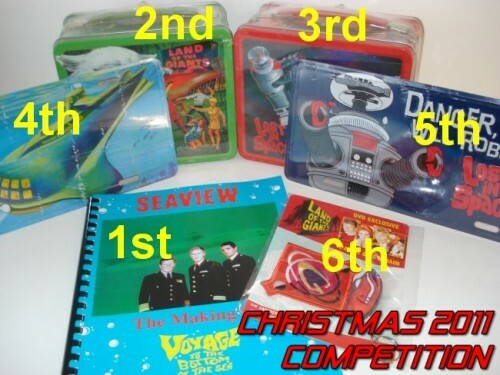 FabGearUSA have very kindly donated six prizes for the IANN Christmas 2011 competition. Click here or on the image below to enter the competition. Entries must reach us by Sunday 11th December 2011.